Wish You a Happy Winter, During winter let us discuss about surface cleaning with dry ice! This new development is quickly expanding around the world. 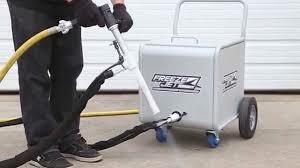 One system uses small rice pellets of dry ice shooting them out of the jet nozzle with compressed air. 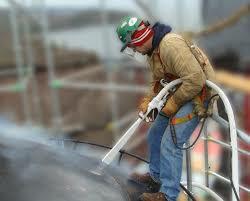 Dry ice blasting is known by several names like dry ice cleaning, CO2 blasting and dry ice dusting. It is a kind of carbon di oxide cleaning, where dry ice in the solid form of carbon di oxide, is accelerated in a pressurised stream and directed in the surface in order to clean it. This method is similar to other forms of abrasive blasting such as sandblasting, or soda blasting substituted for dry ice as a blasting medium. This method is superior to sandblasting because the dry ice is soft enough not to pit or damage the underlying surface. Since the dry ice evaporates completely as a gas it leaves no wastes. Only the material being removed must be disposed of. Dry ice blasting is the superior alternative to sand blasting, short blasting, soda blasting, water blasting and hand cleaning. · No need to dismantle machines for cleaning. The pellets easily reach into the smallest nooks and corners. 1. The loud noise produced requires protective ear equipment and may cause irritation to other people nearby. Although new machines are much quitter. 2. Effective can only occur in a straight line of sight from the dry ice jet nozzle. Sometimes parts can be dissembled to help. 3. 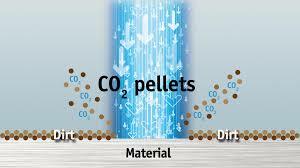 Large amount of carbon di oxide are released which can be harmful if not ventilated out of space.